Time for a new post about baking, a detour from the incessant talk about Slackware Linux and Open Source Software. Today’s topic is “brabantse worstenbroodjes” aka dutch sausage rolls. I wrote about these worstenbroodjes on Google+ (in the Art of Baking community of G+) after I had baked a first batch early last year. Recently I revisited and revised the recipe when I made a new batch to “celebrate” my last day as an IBM employee. My colleagues loved them. The most important revision is my spice mix, which is more complex than the simple initial attempt, which contained way too much salt. I also opted for pure beef instead of a pork/beef mix. These worstenbroodjes are halal / kosher. In March 2016, the brabantse worstenbroodjes were added by Unesco to the natoinal list of “immaterieel cultureel erfgoed”. In english this is called the Intangible Cultural Heritage List. That sounds big, but actually it is simply a new way to preserve old traditions for future generations. In this case, a tradition originating in the southern region of the Netherlands: Noord-Brabant is a province of the Netherlands. Sausage rolls were initially created as a means to conserve meat by rolling the meat into bread dough and cooking it. Traditionally the brabantse worstenbroodjes were consumed only at special events with a religious context: at the end of Carnival, late tuesday night as a means to compensate for all the alcohol (further south people would consume herring on rye bread instead); and when coming home from night mass on Christmas Eve. Essential part of the tradition is that worstenbroodjes are meant to be shared with friends and family as part of a get-together event. The brabantse worstenbroodjes are made from yeasted bread dough, which is wrapped around a sausage of beef & pork mincemeat spiced with salt, pepper, nutmeg, mustard (and other spices if you like, but the nutmeg is essential). My recipe will create 30 worstenbroodjes consisting of 35 grams dough and 35 grams meat. Mix flour, sugar and yeast together in a bowl. Combine the water and the milk and heat until lukewarm. Melt the butter and mix the salt and molten butter through the lukewarm fluid. Pour the wet ingredients into the dry ingredients. Mix together during circa 2 minutes with a spoon. Leave this mix to rest for 15 minutes. The process is called autolyse – it ensures that the flour will absorb all the moisture. Dump the dough onto your work area (which you dusted with a bit of four first) and knead for 6 to 10 minutes until you have a supple dough. Place the ball of dough in a bowl and cover the bowl with some plastic wrap or a moist towel. Next comes the “bulk rise” which is the period in which the yeast consumes part of the sugars in the flour which causes the dough rise to roughly twice the original volume. Leave the covered bowl at room temperature for about an hour, or until the volume of the dough has doubled. Divide the dough into 30 pieces of 35 grams each. Roll the pieces into small balls (see video below if you do not know how to do this). Cover the dough balls with plastic wrap or a moist towel. While the balls are resting, mix the mincemeat with the egg and spices. Add as much breadcrumb as you need to create a firm meat mixture. Divide the meat into pieces of 35 grams and roll them into sausages using the flat of your hand. The first video below shows you how. Store the sausages in the refrigerator while you work on the next step. Use a small rolling pin to flatten the individual dough balls. Roll them into ovals that are roughly the same length as your sausages. 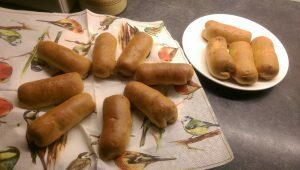 Combine dough and meat into a sausage roll: take a dough oval, place a sausage on top. Fold the ends of the oval over the ends of the sausage by stretching the dough a little. Grab a side of the oval and stretch it over the sausage.Take the other side and pinch the seam with two fingers. Roll the sausage roll under your two flattened hands to make the seam disappear and seal the meat into the dough completely. Place the rolls on a baking tray which has been covered with a baking sheet (paper or silicone). Cover with plastic wrap and leave to rise at room temperature, for at least 45 minutes. This is an essential step. It will create air inside the bread and help prevent tearing of the sides of the bread roll while you are baking it. Pre-heat the oven to 190 degrees centigrade (conventional oven). Optionally if you want a nice shine on top of the worstenbroodjes, combine an egg with a tablespoon of cream and brush the bread rolls with the egg mix. I skip this step. Bake the worstenbroodjes at 190 centigrade during 25 to 30 minutes until they are a golden brown. When you want to add some extra complexity to the flavor, you should try making these rolls with a dough that has been developing in the fridge for at least 48 hours. This is an ideal snack which should be eaten straight out of the oven but still tastes great the next day when cold. You can freeze them after baking if you want. Heat them up again when it’s time to eat them, straight from the fteezer into a pre-heated oven during 12 minutes at 180 degrees centigrade. Posted: 4 December, 2016 in Me, Recipes. Oooh. Looks delicious! I wonder why it is that we don’t use baking scales all that often? The US method of measurements makes no sense at all. Once I convert these measurements to archaic American, I will try this recipe!